This is the Journalistic Freedoms Observatory’s JFO security update for covering Mosul Offensive to retake the rest of the West side of the city, information may be used by journalists and help them boost their mission safely and securely. 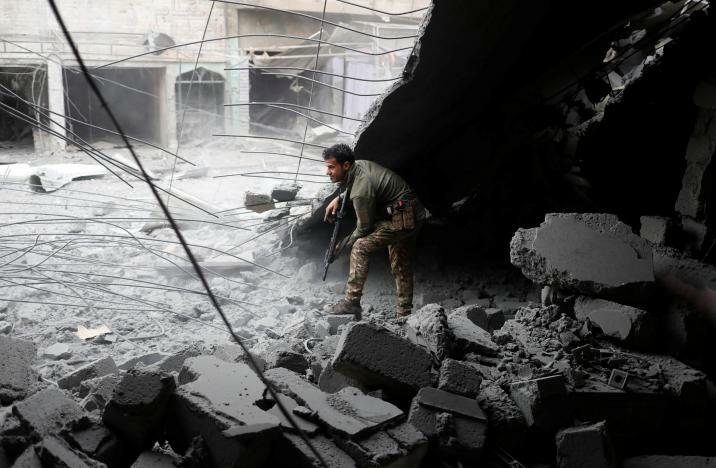 Islamic State fighters launched a counter-attack against advancing U.S.-backed Iraqi forces in western Mosul during an overnight rain storm, as the battle for control of the militants' last major urban stronghold in Iraq intensified. Explosions and gun fire rang out across the city's southwestern districts in the early hours of Thursday. The fighting eased in the late morning, although a Reuters correspondent saw an air strike and rebel mortar fire. Iraqi forces captured the eastern side of Mosul in January after 100 days of fighting and launched their attack on the districts that lie west of the Tigris river on February 19. With the Mosul campaign back underway casualties remained very high in Iraq. 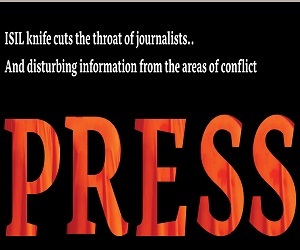 There were a total of 1,832 deaths and 2,458 wounded recorded during the month based upon daily research into over 40 media outlets, mostly Iraqi. An American General added that 500 members of the Iraqi forces (ISF) were killed and 5,000 wounded in the fight for east Mosul. When compared to previous reports that would add an additional 399 dead and 1,634 injured to the total. In January the figures were higher as the battle for east Mosul was still underway with 1,871 killed and 4,302 injured. The effect of the battle for west Mosul was seen by the jump in casualties from the third to fourth week of February. From February 15-21 there were 381 fatalities and 505 wounded. That more than doubled the next week to 630 killed and 1,386 injured. 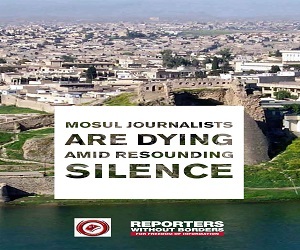 476 of the dead and 1,248 of the wounded, or 85% of the total for the last week of the month were in Ninewa province. When broken down civilians remained the largest victim of the renewed violence. While 1 Sahwa, 1 Iranian Revolutionary Guard adviser to the Hashd, 4 Peshmerga, 71 Hashd-Shaabi, 86 from the Kurdistan Workers’ Party (PKK), and 95 members of the ISF were killed in February, that paled in comparison to the 1,574 civilians that lost their lives. Another 1 Coalition Soldiers, 1 Sahwa, 2 U.S. Soldiers, 5 Peshmerga, 58 Hashd, 273 ISF, and 2,118 civilians were wounded. Violence decline in Anbar, but there were still 63 deaths and 78 wounded there. Western Anbar is still under Islamic State control, and the group is rebuilding in the center of the province around Ramadi and Fallujah. That has led to a steady stream of bombings. During the month there were 3 car bombs along with 2 suicide bombers being killed, and 6 other car bombs destroyed. Babil had 150 dead and 8 injured. That was due to a mass grave with victims of the Islamic State being discovered. It wasn’t that long ago that the province was a large base for the insurgency. Now IS is hardly active there, but its deadly legacy is still being revealed. There has been a decided dip in IS activity in Baghdad since the battle for Mosul began. That has gone up and down since the start of the new year. 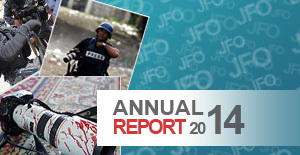 In February there were 139 incidents leading to 204 killed and 501 wounded. In January the militants set off double digit car bombs in the governorate. In February that dipped to just 6, but 4 more were discovered before they exploded. IS used to operate in the heart of the city, but now it has extended its network to the suburbs called the Baghdad belts with supply lines stretching out to neighboring Anbar and Diyala. As a result there are usually just as many incidents in the surrounding towns as the city itself, especially in the south and north. Basra has seen a recent spate of violence. There were 19 incidents in February. Most of those were IEDs with 22 total. Most of these did not result in casualties as shown by the fact that only 3 people passed away and one was wounded. A truck bomb was found and dismantled before it could off. It’s not clear who is behind all of these attacks, but politics is involved in some of them. This has led to a dispute over who should be in charge of security. Hashd groups are demanding that they take over, while the provincial council is asking Baghdad for more assistance. Basra’s government is weary of giving the Hashd any official role, because it knows many of the groups have political aspirations and others were involved in violence and crime before. The Islamic State has been rebuilding in Diyala as well to the consternation of the local government. Their operations in the province are low with only just over one incident per day. Still IS attempts mass casualty bombings almost every week and in February there were 6 car bombings and a suicide bomber was arrested. In total 44 people were killed and 54 wounded. More importantly the militants are using the governorate to ferry men and material into Baghdad. A suicide car bomber was killed in the rural area of northwestern Karbala. This likely came from Anbar. Luckily it was intercepted before it could reach Karbala city. Ninewa was by far the most violent province with 321 incidents, 1,185 dead, and 1,780 wounded. 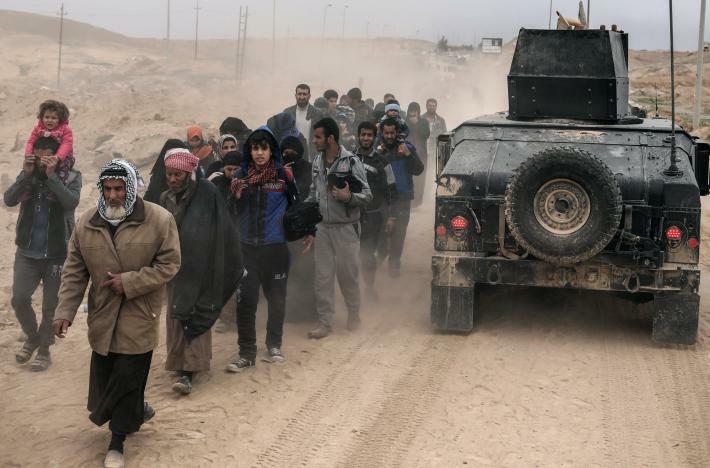 Fighting in west Mosul with its densely packed neighborhoods is taking a heavy toll on the civilians. IS attacks upon liberated east Mosul were also generating a large number of casualties. Salahaddin officials have also been complaining about IS returning to its old dens. Eastern regions of the province have never been cleared and IS continues to launch attacks in the Samarra area and has returned to Tikrit. There are not many total incidents however with just 29 in February resulting in 33 deaths and 23 wounded. Like Diyala, it appears that IS is still in the rebuilding mode in the province. Diyala, Salahaddin and Kirkuk officials have all blamed the Hawija district, which is still under IS control as being a destabilizing force. Politicians routinely claim that IS cells are moving out of Hawija into other provinces. Kirkuk officials in turn constantly call on Baghdad to launch a campaign to free the district. With Mosul still not liberated however, that will have to wait. Despite IS still having a base in Kirkuk violence remains minimal. There were only 21 incidents in February with 61 killed and 13 injured. Most of the deaths were the result of IS executing people or civilians getting killed trying to flee the organization. Turkey regularly bombs PKK bases in northern Kurdistan. Rarely are casualty figures given, but in February Ankara claimed that five such strikes led to the deaths of 86 PKK members. There’s no way to verify these numbers and no injured were given. Ironically, the Kurdistan Regional Government rarely says anything about these air strikes as the Kurdistan Democratic Party (KDP) is aligned with Turkey and the PKK is a long time rival in the larger Kurdish movement of the Middle East. Defeating Islamic State in Mosul would crush the Iraqi wing of the caliphate declared by the group's leader, Abu Bakr al-Baghdadi, in 2014, from Mosul's grand old Nuri mosque. Residents reported that civilians were killed in an air strike on an Islamic State-run mosque on Wednesday, highlighting the perilous situation facing hundreds of thousands of Mosul residents as the allied forces step up their campaign. The residents said the blast collapsed or damaged a number of neighboring houses, many of which are badly made and poorly maintained. A spokesman for the U.S.-led coalition said he was not aware of an air strike on the Omar al-Aswad mosque. 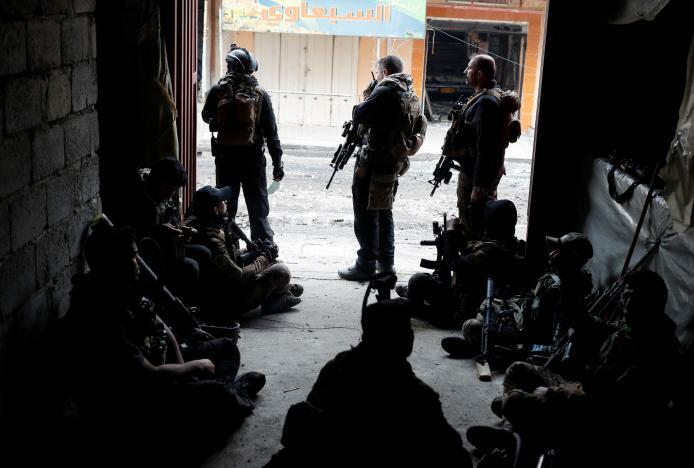 The mosque was where Islamic State sent members of the Iraqi national police and armed forces to surrender their weapons and register in a militant database when the group seized control of the city in 2014. In return they received a pass to prevent their arrest and possible execution at militant check points.